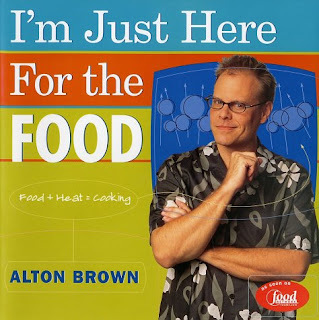 On Saturday, I had the opportunity to thank Alton Brown for a kindness that he showed Mason years ago. I wasn’t going to disturb him and had actually walked away, but in a split-second decision I chose to turn back. I really wanted to let him know that, years later, someone still remembered a kindness that he had extended. Because I think that acts of kindness should be recognized whenever possible. So, I tapped him on the shoulder, thanked him briefly, he shook my hand and then I moved away...hoping against hope that I hadn't disturbed him too much. At almost 4 years old, Mason had been watching Good Eats almost every day of his life; he absolutely loved that show. So when we ran into a Good Eats filming-in-progress at Harry’s Farmers Market, the mother bear in me just had to introduce him to his hero. Despite some irritations he was evidently experiencing, Mr. Brown immediately switched gears and was so very kind to Mason. In retrospect, it occurred to me that disturbing someone as they were in the midst of work-related problem solving was not a good idea. However, I was about 7 months pregnant at the time and full of all sorts of motherly hormones so I wasn’t thinking very clearly. Years later, I am still so grateful to Mr. Brown for not rebuffing us and instead making a point of charming little Mason.